What is emerging is a profound lack of vision and leadership coming out of Washington. This has tempted the Russians under Putin. And that has forced the Germans under Merkel to reconsider their choices. This is something they do not want and their vision is not brilliant either. All this has badly disturbed the long lasting European dispensation. What is truly lacking is a sensible economic vision that is not seen as beggaring your neighbors. Do that and even Russia will finally make real peace and join the EU as well. Otherwise, what is seriously need is a border commission with the capability of effecting voluntary population shifts. Such shifts need not be even physical but can exist as a right with attached voting rights also dealt with. This can be done with German leadership at least. Hopefully some of this happens or they come up with a better road-map or we continue to muddle along..
As you may imagine, i am extremely unhappy with both the insect catastrophe rolling through American farm lands, but even more by the level of disinterest. Do we really have to see the human population collapse before we act responsibly? We are seeing the bee collapse. We are seeing the monarch collapse. We are not even measuring the thousands of other insect losses taking place out there. My only comfort is that while this will get worse, organic agriculture is beginning to seriously take off and we have at most another twenty years of this ecocidal crap. The farmers want that and they are progressively becoming more and more disenchanted with industrial farming and its economics. The species will survive in Refugio and will recover. We just did not need this. The monarch butterfly’s round trip to and from Mexico takes it past a killing field of agriculture. But farmers aren’t entirely to blame for the insect’s decline, said Dan Ashe, director of Fish and Wildlife. For those who do not get it, truth and compassion and tolerance is the first serious step that takes you on the spiritual path hinted at by religion and all that. Without that first rather subtle step it is almost impossible to open your mind to interface spiritually. Thus another film highlighting these ideas will hardly resonate among those who adhere to a material interpretation however wrong. They need to impose and intimidate and enforce a form of mental slavery to sustain their vampire life way. In the end all those material dreams of empire must fall away and will. This is in a tradition of continuous resistance until something gives and the avalanche washes out the dams of state resistance. There’s a recent film produced stateside by an American director that has angered a communist nation to the nth degree across the seas. It underscores all the reasons to have freedom of speech, freedom of press, and is at the core of all the discussions you have heard across the web and social media. It is a part of the reason why many emails and computers, here in the United States have been hacked and why corporations have been pressured to distance themselves from the subject matter. The interesting thing is, you actually might not know the name of the film. “Free China: The Courage to Believe” is a documentary film about Chinese-American Charles Lee and a biochemist from Peking University Jennifer Zeng who endured torture and imprisonment by the Chinese Communist Regime. Why were they tortured and imprisoned? Well, while it might sound surprising, these two individuals were tortured, imprisoned, and almost killed simply for their belief. This is the plight of the Falun Gong. Three simple words—truth, compassion, and tolerance—is what they stand for, what they try to adhere to, but inside China it is illegal to practice this belief and meditation. If you walk through the conceivable reasons why, it doesn’t make any logical sense, but genocide never makes any logical sense, nor should it. ‘Free China’ has won over a dozen international film awards and has been screened over 1,000 times all across the world. 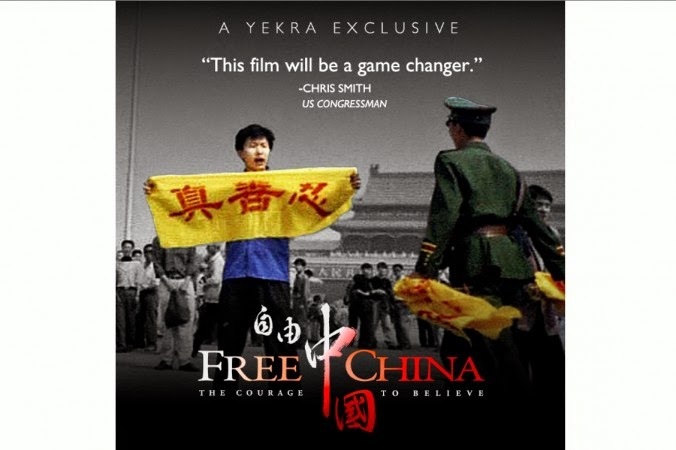 Now the film is available for digital rental and purchase, through Yekra (visit HelpFreeChina.com to rent or buy the film). Film director, Michael Perlman, and producer, Kean Wong, teamed up after meeting, and quickly set on a course for telling this much needed tale of courage. They both firmly believe that if the Chinese regime opens to Falun Gong, it will have great positive impact on Chinese society. “I think that is why the Falun Gong issue is so critical, because if truth, compassion, tolerance and other beautiful spiritual practices out there are allowed to spread, then the morality of the entire nation can revive itself,” said Wong. “If individuals and families are given the freedom to live a moral life so that the society they are a part of is one that embraces and cherishes moral values, that is what China needs,” he added. Perlman says he directed the film with the hope that it could bring about change in China, and actually strengthen a nation. “History is on the side of freedom around the world,” said Perlman. If you have ever wondered what Falun Gong is, if you have ever wondered why peaceful smiling Chinese with yellow t-shirts hold up signs to garner attention, if you have ever wondered why people are willing to stake their lives for their belief, then watch this film. This is an unexpected thought. it may even stand up and work. For myself i find the whole enterprise disconcerting but that is because i have no experience as yet learning how to pronounce Chinese. I do find folks are learning to use both here in Vancouver with ample dexterity so it does not make any of it impossible. I am more concerned about the limitation if it is real on robots as that is becoming necessary. At least wee now understand the issue and what affects it. The tone pitch is a key element of communication in all languages, but more so in some than others. German or English, for example, still remain comprehensible even if all words are intonated evenly by a robot. In Mandarin Chinese, however, the pitch tone can completely change the meaning of a word. "Ma" with a level pitch means "mother," while "ma" with a falling then rising pitch would mean "horse". "Only those who hit the tone pitch correctly can express themselves in tonal languages," explains Seán G. Roberts, a scientist at the Max Planck Institute for Psycholinguistics in Nijmegen. However, the climate can become a problem for the speakers of tonal languages, as the vocal folds in the larynx - commonly known as the voice box - suffer as a result. Even a temporary increase in humidity impacts upon the vocal folds: The humidity keeps the mucous membranes moist and makes them more elastic. It also changes the ion balance within the mucous membranes of the vocal folds. With good humidity, the vocal folds can oscillate sufficiently and produce the right tone. The scientists therefore suspect that tonal languages are less common in dry regions as the wide range of tonal pitches is difficult to produce under these conditions and are more likely to result in misunderstanding. "Modern databases enable us to analyse the properties of thousands of languages. But this also brings problems because languages can also inherit their complex pitches from another language," says Damián E. Blasi, who conducts research at the Max Planck Institutes for Mathematics in the Sciences and for Evolutionary Anthropology in Leipzig. In their study, the scientists have now shown that these effects can be disentangled from the effects of climate. The researchers investigated the correlation between humidity and the significance of tone pitch in over 3,750 languages from different linguistic families. This indicates that tonal languages are significantly rarer in dry regions. In relatively dry Central Europe, no tonal languages have developed like those found in the Tropics, Subtropical Asia and Central Africa. Climate apparently shapes the role of pitch tone in a language and therefore how information is exchanged. Even small effects may be amplified over the generations to produce a global pattern. The climate thus determines the development of languages. "If the UK had been a humid jungle, English may also have developed into a tonal language," explains Roberts. The key date for the global bronze Age is 2400 BC. This is when the Great pyramid appears to have been built using access to high quality copper from Lake Superior. This was sufficient to underwrite a global metal working sea connected civilization we know as the Atlantean. Yet the size and scope screams for the existence of a long prehistory that did not much depend on a metal trade and its natural currency the metal ingot. This prehistory was land based village agriculture without the threat of mobile cavalry..
That expansion took several thousands of years and took advantage of woodland soils. This includes Western China and all the Middle East and the Sahara. The loss of tree cover slowly eroded the hydraulic cycle and the presence of domesticated browsers prevented recovery. The end result was abandonment and movement into lands were irrigation was possible. Because we are looking, we are picking up evidence of this huge earlier population and their tools. This also readfily explains why First atlantean Chinese pyramid building is so far west. That was were the agriculture was. New findings have shown that Chinese civilisation may have much older roots than thought. A study published in the journal ‘Proceedings of the National Academy of Sciences’ has found evidence of a process of rapid desertification in China, 6,500 years ago. Lush areas transformed into arid desert, driving early Chinese people of the Hongshan culture into hitherto unpopulated areas. The Hongshan culture predates the Xia Dynasty, the first Chinese dynasty described in chronicles, by 2,400 years. As the Hongshan existed so early, it could reveal that the root of Chinese civilisation is thousands of years older than previously thought. The importance of Hongshan culture to Chinese history, however, has been hotly debated. Traditionally, Chinese culture is seen as originating in the middle reaches of the Yellow River; Hongshan is often dismissed as a remote culture far from the cradle of Chinese civilisation. Evidence has shown that Hongshan culture was significantly advanced, however. Excavations throughout northern China have revealed artefacts from the Hongshan culture. The Hongshan displayed some of the earliest known examples of jade working and elaborate pieces of jewellery have been found. The first dragon-like carving in China may have been Hongshan. In order to discover more about Hongshan culture, researchers investigated the Hunshandake Sandy Lakes in Inner Mongolia, an area 185 miles (300 kilometres) away from the first Hongshan discoveries. The team found significant quantities of Hongshan pottery and stone items in Hunshandake, indicating that Hongshan culture had been much more widespread than previously thought. The team also analysed environmental changes over the last 10,000 years. Patterns of dunes and depressions between dunes suggested that the Hunshandake area was once covered with rivers and lakes. Lake sediments indicated that relatively deep water existed in Hunshandake between 5,000 and 9,000 years ago. Pollen trapped in those sediments showed that birch, spruce, fir, pine and oak trees were all common at the time. It appears that the humid conditions in the Hunshandake would have created an ideal environment for Hongshan peoples to exist. It was also revealed that the area became much drier around 4,200 years ago. The researchers calculated that 7,770 square miles (20,000 square kilometres) were transformed into desert; Hunshundake remains desert to this day. This process of desertification would likely have had devastating consequences for the Hongshan community in the area. It is possible that the arid climate in the north of China caused a large-scale migration southwards. Hongshan culture, therefore, may have had a formative role in the rise of Chinese civilisation. If this is the case, the team’s research could mean that China has much older roots than previously thought. As such, we may need to rethink the very beginnings of Chinese civilisation, and rewrite Chinese history. This is not the first such story and we actually have seen several. What has been lacking is any form of a credible explanation. At the same time on a deeper level we do not have a good explanation for the manta ray itself. Yet we now know that ordered planar Dark Matter can be used to manipulate gravity. We are actually doing it. All of a sudden the geometry of the manta ray makes real sense as it provides a kite like layer of contained dark matter that can be charged in order to provide a change in gravitational effect. By charging up a manta ray can leave water and use its control of gravity to essentially swim through the air in the same way as it swims in the sea. Why it may do this is not known, but observation shows us that it can and will. I love it when we go from dismissing a story as impossible to finding out that it can be possible with facts superior to any other explanation for the mere existence of the creature in the first place. This is very hard for me to publicly write about. It was so, so strange and I have only told a few people because they just think you are crazy - when you tell them you 'saw a sting ray fly over the street from one bunch of trees to another.' I mean we are in Indiana – nowhere near the ocean for one thing but even if we lived by the ocean, why would a sting ray fly into trees? 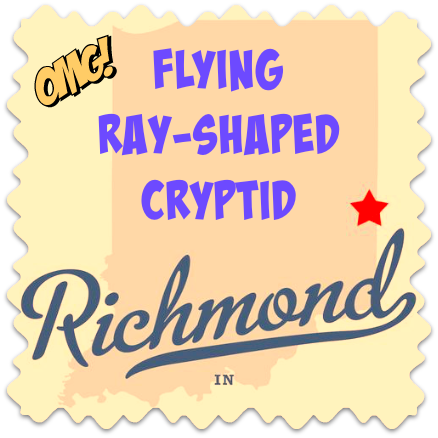 The location was in Richmond, IN between S 16th & E Streets and S 12th & E Streets overhead. I was driving west on E Street. It was grayish (shark-like) gray on top and whiter on the bottom, but it looked just like a giant sting ray gliding over the street. We lived in Florida for years and there are a lot of petting places that have star fish, sharks, turtles and sting rays so I have seen these things up close. It is hard to explain but you know how the edges of a sting ray like wave as it glides through water, well the edges of it were doing the same thing but through the air. I barely saw the long tail thing from the back as I was watching the edges of it wave and glide. An Observation Regarding a Mental Health Hack. Have You Had Your Lemons This Morning? Underground Rise of Neo Fascism in USA? Chinese Yuan Crashes, Central Bank Move Coming?